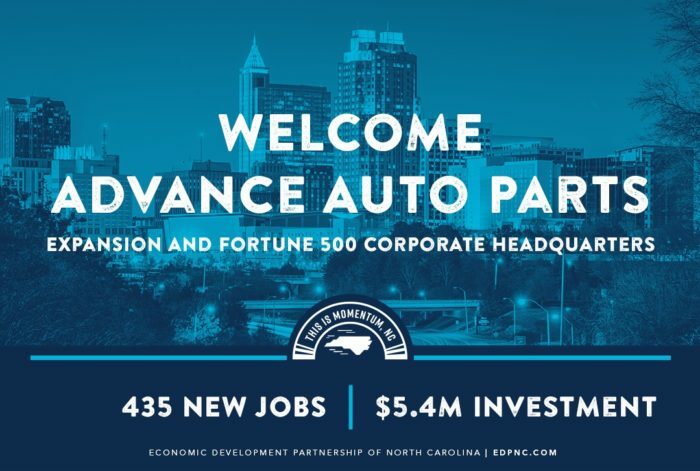 Advance Auto Parts is relocating its corporate headquarters to Raleigh and expanding operations in Wake County, a move that will create 435 new jobs over five years. These positions will enable the company to add value for customers and shareholders and enhance its multichannel business. Teams based in Raleigh will help lead Advance’s long-term integration plans and continued development of technology, eCommerce and digital platforms. Advance provides aftermarket automotive parts to professional installers and do-it-yourself customers. As of October 2018, Advance operated nearly 5,000 stores in the United States, Canada, Puerto Rico and the U.S. Virgin Islands. The company also serves more than 1,200 independently owned Carquest branded stores. Advance currently has more than 2,900 full-time employees in North Carolina, including over 700 based in its existing offices in Raleigh. This project is an expansion of the company’s existing corporate functions, and the majority of roles will be focused on technology, data analytics and eCommerce, among others. Salaries for the new jobs will vary by position and experience. Once all positions are filled, the annual payroll impact will be more than $46 million. The Advance Auto Parts headquarters location in Wake County will be supported, in part, by a Job Development Investment Grant (JDIG) approved by the state’s Economic Investment Committee earlier today. Over the course of the 12-year term of this grant, the State expects the project will grow the state’s economy by an estimated $1 billion. Using a formula that accounts for the new tax revenues generated by the new jobs, the JDIG agreement authorizes the potential reimbursement to the company of up to $9,380,250 spread over 12 years. State payments only occur after company has met its incremental job creation and investment targets. Because Advance chose to designate its corporate headquarters in Wake County, classified by the state’s economic tier system as Tier 3, the company’s JDIG agreement also calls for moving as much as $3.1 million in new tax revenue generated through the grant into the state’s Industrial Development Fund – Utility Account. The Utility Account helps rural communities finance necessary infrastructure upgrades to attract future business. Even when new jobs are created in a Tier 3 county such as Wake, the new tax revenue generated through JDIG grants helps more economically challenged communities throughout the state. Learn more about NC incentives.